J. S. Burke is an author, artist, and marine biologist, studying creatures of the dark abyss and diving on coral reefs. Her stories blend imagination with real science and author experiences. She lives in Georgia with her family and rescue companions. 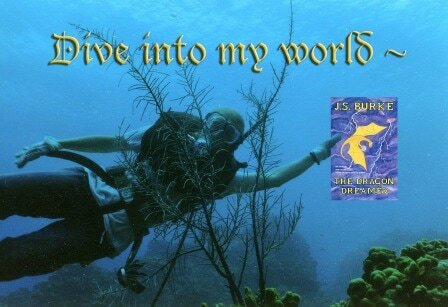 The Dragon Dreamer is a fast-paced science fantasy / adventure with flying dragons, an undersea world, and an unexpected friendship. It's a young adult science fantasy for ages 8 to adult. Arak can quest for hours in trance, his mind far away. He is different, a worthless dreamer, tormented by other young dragons. Finally Arak leaves the clan, flying far over the sea, and crashes on a remote ice floe. He suffers serious injuries and the loss of his trance-stone. A fearless, shape-shifting octopus named Scree finds and heals him, and an unexpected friendship begins. Arak returns to the Winter Festival, where dragons carve glaciers with fire and toss lightning bolts in the clouds. But a devastating illness stalks the clan. When an undersea volcano erupts, it triggers a towering tsunami and a deadly chain of events. Can Arak use his unique talents and alliances to save the dragons? Dragon Lightning is a stand-alone book and the second in the Dragon Dreamer series. It's a fast-paced adventure with flying dragons, an undersea world, and unlikely friendships. This science fantasy is layered for readers age 9 to 99.